We told you Hamilton mastermind Lin-Manuel Miranda would still be in our hearts (and in the headlines) post-Ham! 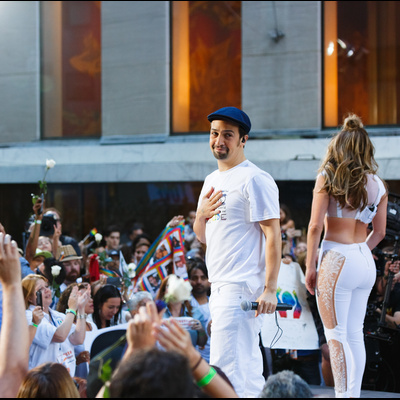 Fresh off of his final performance, the Tony winner joined fellow New York native and Latin pop superstar Jennifer Lopez onstage at The Today Show on July 11 to perform their single, "Love Make the World Go Round," a tribute to the victims of the tragic Orlando shooting that occurred on June 12. The audience included 50 survivors and victims' family members. Proceeds from the track, which is currently in the third slot on the iTunes Top Songs chart, will benefit the Hispanic Federation's Proyecto Somos Orlando; 95 percent of the victims in the deadliest mass shooting in U.S. history were Latino. Check out J. Lo and Miranda's anthemic performance below!